Welcome to our spring entryway! I opened the front door to let in a little more light so you are seeing the front door in the mirror. The quality is amazing and the colors are perfect for spring. A little past our doorway is the cove in the stairs. You've seen this but it's refreshed a little for the new season. This is the home to the nest I refluffed the other day. That pretty little print down there sure is making me smile! It's an absolutely beautiful spring so far here in Big D! Makes fluffing the nest so much more fun. I hope it is beautiful where you are. That is a beautiful painting and a good size to really show up. The colors are perfect for Spring. I love that you use books in your decor and turn the lamps on. Your home is lovely! Sweet hugs! The entry looks very inviting and the little bit of red in the photo is a cheery welcome! Your wood floors are beautiful, too! Happy Spring! Your new artwork from Lucy at Craftberrybush looks great in your entry. I like you new painting! You have created some pretty vignettes in your entry. Fluffing for a new season is so much fun. You've inspired to add a little spring around the house. I love your new artwork. The painting is very pretty...the whole foyer is. I love how the walls curve. Oh, your new painting is just lovely!! It would make me smile each time I saw it, too! I like the red and turquoise accent in your entry. PERFECT for spring! Your home looks so inviting and warm, Stacey...the kind of place you could kick of your shoes and stay awhile. Oooh, I love your new artwork. Your entryway looks so fresh and welcoming. I love the colors in your new artwork! Those mirrors look great in that little cove and your nest is right at home there. :) Such pretty paint colors and wood floors! I love the painting! the colors are wonderful and so is the subject. You have a really pretty entry and I love the Spring touches. What a beautiful painting! Your entry is very welcoming! 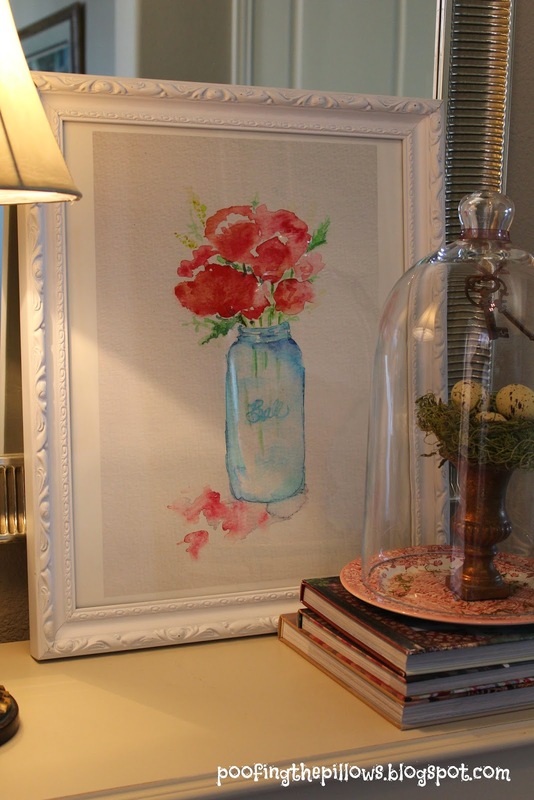 I often have a Ball jar full of flowers somewhere in the house and I love the look. You have it permanently captured in the painting. Enjoy the nice weather. Our colder weather arrived as soon as spring hit. Love the entry, love where the nest landed too! 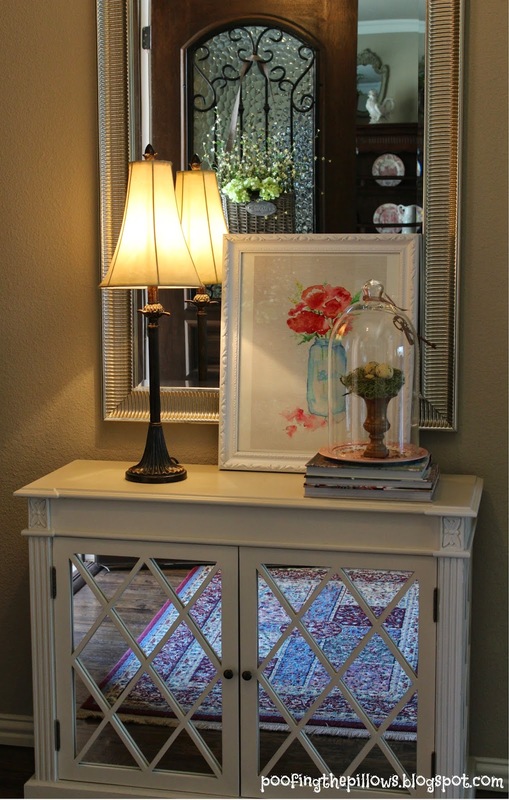 Very pretty entryway in your home - and I love your new painting! Your entry looks so fresh and pretty! Always love reflections in mirrors. The painting from Lucy is so lovely!! Love it and the curved wall is gorgeous too! We're supposed to get rain all weekend. Oh well I'm teahing my daughter in love to make homemade ravioli! Oh what a lovely visual treat you have blessed me with. It looks fantastic. Stacey, your artwork is SO pretty, as is your entry! All ready for spring, now it must come!! Thanks for sharing at Best of the Nest! What a lovely blog. So like your bog header and name. Enjoyed my visit... will come again. 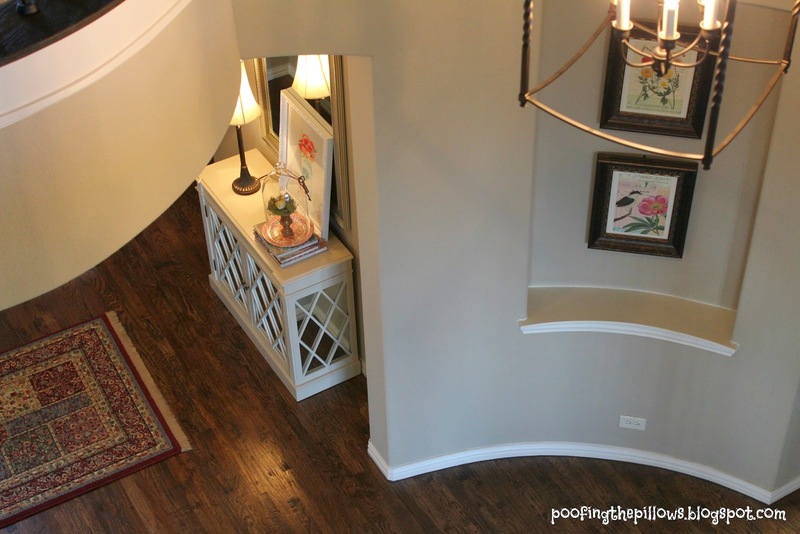 Your foyer (including front door) is beautiful! I love your hardwood floors and staircase too. The round table you placed in the cove area is perfect there. I like the artwork you bought. It brings a bit of color to that area. Yes, that is a beautiful painting! Love the colors and subject matter. You have a beautiful entry! Stacey, I love ball jars filled with flowers. This painting is gorgeous! Love the colors and the beautiful frame. We have had gorgeous weather, but raining today. I like Spring rain. Helps bring the gorgeous flowers. Thanks so much for my seeds. Can't wait to plant them! So happy to have you share with SYC. I love your new painting. 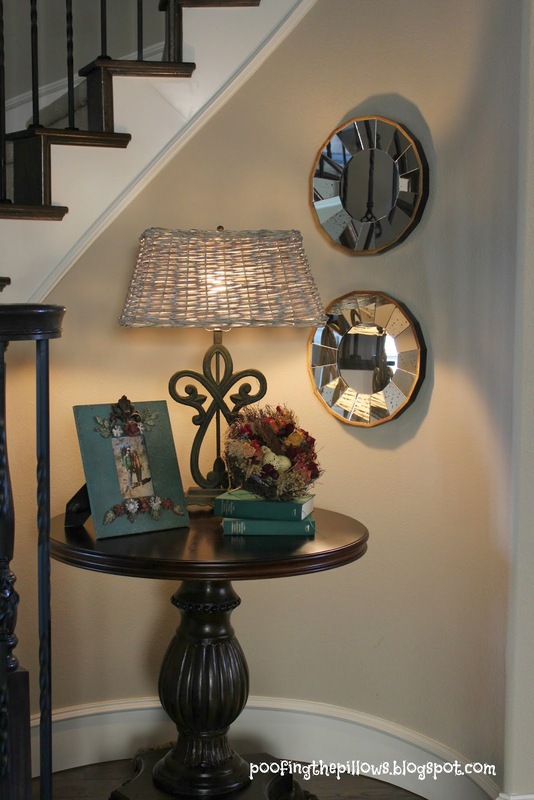 It looks prefect in your Spring entryway. You have a lovely home. Thank you for stopping by for a visit. Wishing you a wonderful new week.